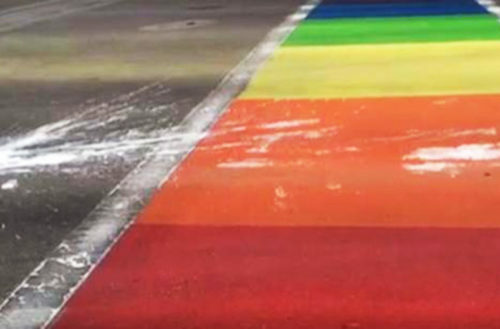 Sometime late Monday night or early Tuesday morning, vandals defaced a rainbow crosswalk in Tuscon, Arizona using a cup of white paint. The vandalism occurred mere hours after the crosswalk had been finished and before the city’s official dedication ceremony. Cties around the world paint rainbow crosswalks to show support for their local LGBTQ communities and gayborhoods, but the crosswalks can be costly. The ones in Atlanta, for instance, cost $196,000 to install. These crosswalks have also become an easy and popular target for cowardly, homophobic vandals. When they deface them, local taxpayers (who are predominantly straight) end up floating the bill. In mid-July 2017, a vandal painted over a newly installed rainbow crosswalk in Woodstock, a town in New Brunswick, Canada. The town’s LGBTQ community held a rally soon after and the town council had the crosswalk repainted by the following Monday. In June 2017, less than a week after being unveiled, crosswalks painted with the rainbow and transgender flags in Lethbridge, Canada were marred with skid marks, tar and manure. Online commenters said that such marks were normal for street crosswalks, but a week after the crosswalks had been cleaned, they were defaced again. In December 2016, dirt bikers deliberately left skid marks on the rainbow crosswalks in the Castro district of San Francisco. The crosswalks had been damaged twice before: once during the filming of the gay history miniseries When We Rise and three months after the damages from the filming were repaired. In November 2016, a 23-year-old was arrested for deliberately leaving rubber skid marks on a rainbow crosswalk in New Glasgow, Nova Scotia. The city had to repaint the crosswalk a week later. 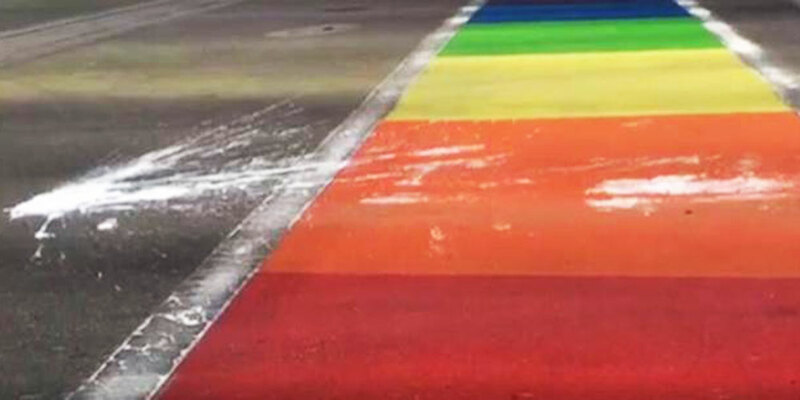 Hours after it was completed in July 2015, witnesses saw a 91-year-old man pour white paint onto a rainbow crosswalk in New Westminster, a town in British Columbia, Canada. The man was quickly arrested and the crosswalk was restored the very next day, days ahead of the city’s weekend Pride celebrations.